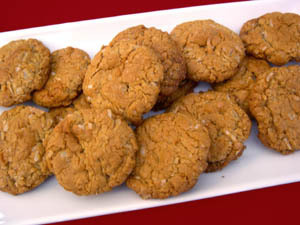 Paul from the Blue Mountains wrote asking for a recipe for the famous Australian Anzac biscuits (cookies). Here they are. Famous Aussie Bikkies that are quick to bake. Makes 24. Preheat the oven to 150° C / 300° F. Combine the oats, flour, sugar, and coconut in a bowl and mix well. Melt the butter and syrup together in a small saucepan. Boil the water in another small saucepan. Sprinkle the soda into the boiling water and add this to the melted butter and syrup. It will froth up. Add this foamy mixture to the dry ingredients and mix well. Place tablespoonfuls of the mixture on 2 large buttered trays. Bake in the upper half of the oven for 20 minutes, or until the cookies are golden. Allow the bikkies to cool a little on the trays before removing. Note: for a slightly different textured Anzac that melts in the oven to a crisper consistency, use 2 tablespoons golden syrup and 3 tablespoons boiling water.